Apple’s latest mobile operating system, iOS 8, has been available to the public for about a week now and, predictably, the bugs and issues are starting to trickle out. While there haven’t been any major problems reported, one annoyance has plagued many users. Thankfully, as Leslie Horn reports for Gizmodo, there’s a quick fix for users who are experiencing slow WiFi connections in iOS 8. This isn’t an issue that is spread to all iOS 8 users, but there has been a significant number of complaints that WiFi seems slower since the upgrade. That extends to multiple models of iPhones and iPads too. 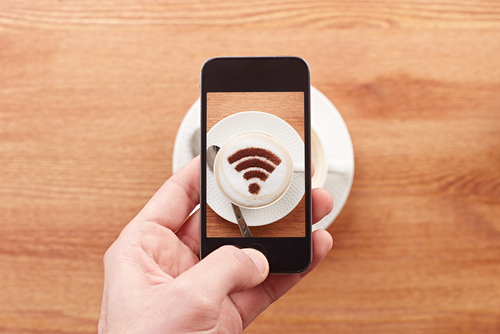 If the slow connection is troubling you, one solution would be to simply turn off WiFi on your device. But, if you’re using an iPad without a data plan, or have limited data on your smartphone, this isn’t exactly a good option either. To fix the problem, there are a couple of options. First, try resetting your network settings. For some users, this brought WiFi speeds back up. If that doesn’t help, the other option is disabling WiFi Networking. To do so, go to Settings>Privacy>Location Services>System Services and turn WiFi Networking to off. This is the first widespread bug reported for iOS 8, but it’s unlikely to be the last. While Apple will likely work quickly to patch and fix any issues that surface in the next few weeks, it’s not a bad idea to stick with iOS 7 if you can until more of these bugs are found and fixed. If you’re having trouble with any of your mobile devices, bring them to Geek Rescue or call us at 918-369-4335. You’ve likely heard plenty about iOS 8 in the past week and may have even updated your Apple device, but do you really know what iOS 8 is capable of? More importantly, do you know why it’s better than the previous operating system, iOS 7? At Gizmodo, David Nield put together a handy list of “things you can do on iOS 8 that you couldn’t do on iOS 7”. Here are seven new features that are most useful. This new feature has actually gotten quite a bit of publicity and led others to wonder why it was never before possible to add a different keyboard to an iPhone. There have been many complaints about the native keyboard in iOS, although just about every digital keyboard has its quirks. Now, you can go find the keyboard that fits your typing habits best. Here’s another feature that surprisingly wasn’t already available. By going to Settings>General>Usage>Battery Usage, you’ll be able to see how each app is affecting your battery. This could prove to be extremely useful in situations where your battery is low and you’re nowhere near a charger. Or, could help you decide if a new app is worth the trouble or not. Creating timelapse videos is now possible by simply enabling an option in the Camera app. One frame of video will be captured each second. These timelapse videos will then be saved to your photo stream with a timer icon in the corner to help you identify them. 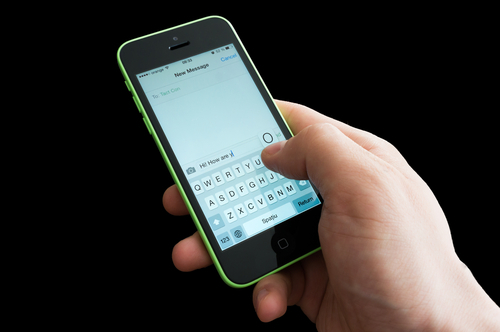 Group texts between multiple contacts are handy, but can quickly become an annoyance. In iOS 8, you’re now able to remove yourself from group chats you no longer want to be a part of. Select the ‘Details’ option from conversation screen to see this option and other new choices. If you’re ever in a position where you don’t want to send a text message, but also don’t want to talk on the phone, there’s the new feature of Voice Messages. These are simply short audio recordings you can send directly to contacts. It’s like leaving them a voicemail, but quicker. In iMessage, press and hold the record button to start a new message, or press play to hear a message you’ve received. A timer has been a standard feature for digital cameras for years and now your iPhone can take pictures on a three to ten second delay. To enable this feature, tap the timer icon in the Camera app and then quickly gather your relatives for a group shot. First, Apple Pay will let you purchase items without having your credit card with you. You’ll load the card’s information into Apple Pay and then pay directly with your iPhone. 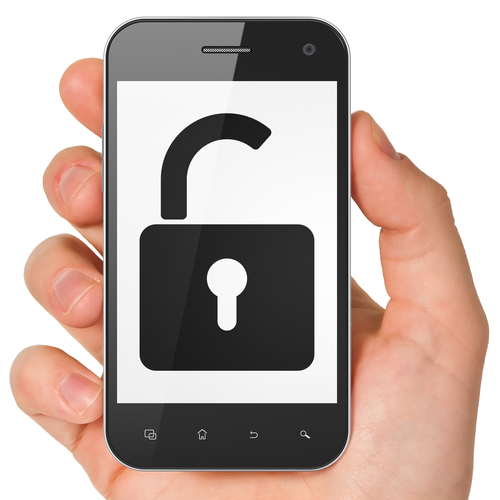 A useful idea, but also one that makes your phone even more valuable to criminals. Adding your card’s information to Apple Pay could be tedious, but iOS 8 enables the ability to scan credit cards. You can also use this feature when buying items online. Just use the ‘Scan Credit Card’ option in Safari. 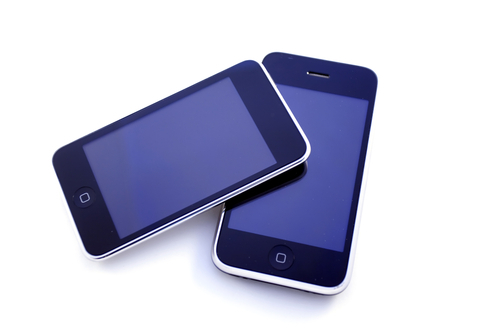 If your iPhone or iPad have any kind of issues, bring your device to Geek Rescue or call us at 918-369-4335. In September, Apple released iOS 7. Since then, users have been waiting for the next update that would fix bugs and introduce new features. There have been plenty of stories predicting what the update would contain, but no one could know for certain. This week, iOS 7.1 was officially released and in just a couple of days, adoption is already close to 10-percent for eligible devices. Eric Zeman of Information Week reports on the iOS update and what’s new for iPhone, iPad and iPod Touch users. 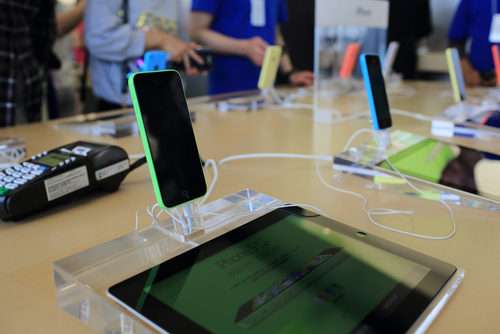 Many users complained that their device reset unexpectedly after updating to iOS 7. This soft reset wouldn’t delete any apps or saved data, but would interrupt whatever activity the user was currently engaged in. One of the primary goals of the update to 7.1 was to fix this annoying bug. So far, users are reporting that the reset problem has been solved. Apple’s virtual personal assistant received an upgrade in iOS 7.1. While Siri will still actively listen for voice commands, there’s an added option of manually control when Siri needs to pay attention. Users can hold the Home button down while they give a command and release it when they finish directing Siri. There are also a number of new voice options for Siri in a variety of languages. 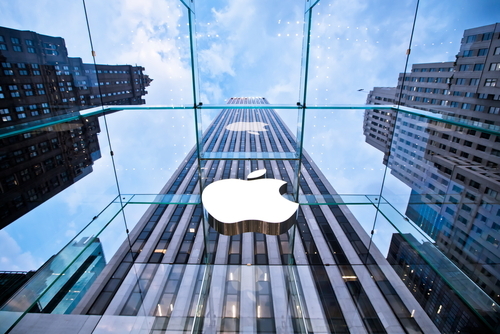 Apple is still excited about the possibilities of iTunes Radio and continues to roll out new features for it. In iOS 7.1, users are able to make purchases easier from their mobile devices. Previously, users can now purchase music directly from the “Now Playing” screen in iTunes Radio and even buy entire albums. Users are also able to subscribe to iTunes Match directly from their iPhone or iPad. The search function for iTunes Radio was also tweaked to make it easier for users to access it quickly. Perhaps the most anticipated addition included in iOS 7.1 allows iPhone and iPad users to integrate their devices with their cars. Before you get too excited, know that cars that support CarPlay aren’t even on the market yet. Some upcoming 2015 models are expected to include that feature. In the meantime, Apple’s devices are already ready to go. Users with CarPlay will be able to use Siri, navigation, messaging and access their music. As always, it’s recommended that you back-up your device before installing a significant update like this one. 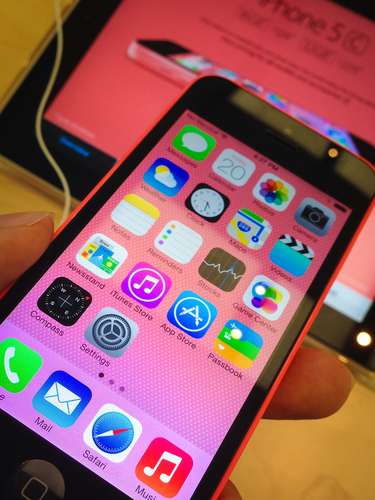 Downloading and installing iOS 7.1 reportedly takes about 10-minutes over a WiFi connection. If your device has issues that an update won’t fix, bring it to Geek Rescue or call us at 918-369-4335. Apple’s mobile operating system, iOS 7, was released in September and since then, more than 80-percent of users with supported devices have adopted it. After a few rounds of beta updates, Apple seems poised to release the first significant update to iOS 7. As JC Torres of Slash Gear reports, iOS 7.1 is rumored to be released in March. Don’t expect 7.1 to break any new ground, however. For the most part, the update is being released to fix common bugs and functionality issues users have reported, not to improve existing features or introduce many new features. You can expect a few visual tweaks. The slide to unlock, dialer, keyboard and music functions are all expected to look a little different in iOS 7.1. When sliding to turn off your iPhone, you’ll rounded slider at the top of your screen and a white cancel button at the bottom. Slight adjustments to the slide to unlock screen and animation are also being made. When answering calls, you’ll have the option to accept or decline in green and red circles, instead of rectangles. You’ll also have actual icons above those options for ‘Remind Me’ or ‘Message’. The dialer has become visually more attractive with color gradients and accents. The large green ‘Call’ rectangle has also been replaced with a smaller, circular phone icon. In the music app, users may notice more prominent buttons for repeat and shuffle options. Those are now ‘Repeat Song’ and ‘Shuffle All’ and have a pink background behind them. Another minor change comes in the keyboard, where the shift and delete buttons are now more prominent and easier to discern. There are also new options in Calendar and animation tweaks to the Control Center and Messages. Perhaps the most exciting change coming wrapped in iOS 7.1 is iOS in the Car. This new features allows you to connect your iPhone to compatible cars and display iOS content like maps, directions and messages on the navigation screen. The other exciting news surrounding the coming iOS update is a promised fix for the infamous ‘white screen of death’. This glitch has been causing many users to suffer unexpected reboots and crashes. 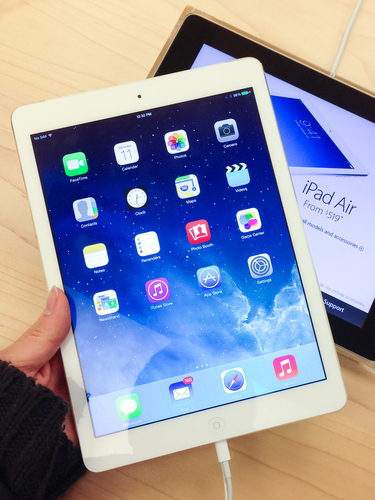 Users of the iPhone 5S, iPad mini with Retina and iPad Air have all reported this problem. If your Apple device’s problems can’t be fixed by an iOS update, call Geek Rescue at 918-369-4335 or come see us. We fix hardware and software problems, as well as malware infections and more. There are still some users who don’t enjoy interacting with Apple’s iOS on their iPhone or iPad. For many of these users, their frustrations stem from not knowing the full capabilities and functionality of the operating system. At LifeHacker, Whitson Gordon has a list of shortcuts that make interacting with iOS more efficient. While some more advanced users will know many of these, there’s something for everyone to learn. For most users, this has become intuitive. But, some don’t realize that this gesture refreshes in nearly every situation. Pulling your email’s inbox down to check for new messages may be common knowledge, but you can also pull down a webpage to re-load it or pull down an app to refresh the content. Just make sure you pull down until you see an icon, then release to refresh. One common complaint about messaging in iOS is that timestamps aren’t included. Actually, they are but they’re not visible. To see when a message was sent or received, swipe left on the message. Use the same swipe over an email in Mail inbox to see more options, like a quick way to delete. This is another gesture that works in nearly any situation in iOS. To go back one screen, or even back to the previous webpage, swipe from left to right. If you swipe slowly, you’ll be able to preview the previous screen before you decide to go back. If you swipe the opposite direction in Mail or Safari, you can go forward a screen. It feels a little cumbersome typing on an iPad’s digital keyboard. There’s a second option that not everyone knows about, however. Hold down the keyboard key, or just simply pull the keyboard apart to get a more comfortable split keyboard. Now, you can type with your thumbs like you do with a smartphone and you can move the keyboard to anywhere on the screen. If an event you’ve stored in Calendar needs to be changed, you could edit it and type in the new details. An easier way, however, is to hold down on the event in Day mode, then move the event to a new day or time, or even change the duration. Any saved drafts of messages are available in Mail’s main menu with the rest of the folders, but to reach them quicker, just hold down on ‘Compose’. A list of your drafts will pop up as a menu you can choose from. 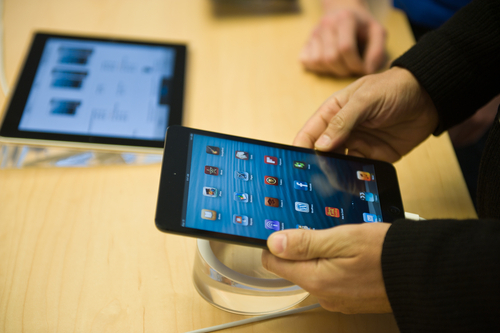 These tips allow you to access functions of your Apple device faster and use it more efficiently. If you have other problems with your device, like slow performance, malware infections or broken hardware, come by Geek Rescue or give us a call at 918-369-4335. Apple released iOS 7, its latest version of the operating system included on iPhones and iPads, in the middle of September. Here it is three-months later and iOS 7.1 has taken another step closer to its release. Unlike iOS 7, 7.1 won’t be so groundbreaking and will feature mostly bug fixes and small tweaks. As Carly Page reports for Inquirer, the second Beta version of iOS 7.1 has been officially made available to developers. Perhaps the most exciting of the included tweaks is a toggle for ‘Car Display’. In and of its self , this isn’t that exciting but it hints at something Apple may release in the near future. ‘iOs in the car’ has long been a rumored feature bound for release. This feature would allow users to link their iPhone or iPad to their car in order to control their music, navigation and messages while driving. Other changes in this version of iOS include some tweaks to settings menus. Touch ID and Passcode settings have been moved to the main Settings menu to make them easier to find. In iOS 7, they’re buried under multiple options. Users will now also be able to adjust button shapes through the Accessibility setting. The iTunes Match process has been made faster than ever, which it easier for users to access music stored in the cloud. Also faster is the animation speed used for all interactions with the operating system. This doesn’t actually make the device faster, but it will feel faster than before. Many of these small changes won’t even be noticeable to many users, but they will make devices easier to use and introduce some options for more customization. The second Beta version of iOS 7.1 is currently available for download at Apple’s developer website. At Geek Rescue, we know the ins and outs of iPhones, Androids and all smartphones. If your device is giving you trouble, bring it to one of our locations or give us a call at 918-369-4335. This week, Google made its new iOS app available to iPhone and iPad users. Experts are praising its improved functionality and additional features. Salvador Rodriguez, of the LA Times, published his favorite new features. Here’s a list of the Google apps new features and why you’ll like them. The Google app’s image search has been upgraded to allow for more user interaction. After selecting an image from search, users can zoom in on that image, or use two fingers to minimize the selection and continue searching. Siri has attained her share of critics from iOS users, but Google’s voice search is improved as a superior alternative. The Google app has to be open to be used, but when it is, users only need to say “OK Google” and the app will start listening for voice search. The speech recognition ability within the app is considered by most to be better than Siri. Previously, Google Now notifications were only available to Android users. In the new Google app, these notifications are available on iOS. Users are able to set reminders based on time, or when they reach a specific location. For example, you could remind yourself to buy an item at the store and Google Now would send your phone a notification once you’ve reached the store. Google Now also features new cards that show you what you’ve purchased and reserved recently. Tickets for movies, concerts and other events are displayed here. Also, airplane tickets, car rental reservations and hotel reservations are stored here. There’s even a listing of upcoming events in your area. These new features make Google’s iOS app more useful and easier to use. If you have an iPhone or iPad, it’s a worthy addition. If you’re having trouble with your Apple device, or any device, come by Geek Rescue, or call us at 918-369-4335. If it boots up or turns on, we fix it. There have been relatively few true threats to the security of iPhones compared to the amount of malware being produced for Android. A serious threat has recently emerged, however. Antone Gonsalves, of Network World, reports that a team of security experts uncovered a vulnerability in a large number of iOS apps. The flaw allows for a third party to intercept data and then send their own directly onto a user’s device. The team is calling it “HTTP Request Hacking” because it allows hackers to intercept HTTP traffic between the app and server. The hacker can then tell the app to retrieve data from a different server, which usually involves putting malicious links on your iPhone and iPad. This method is particularly effective for news apps because the hackers can put fake links in the news stories, which cause malware to be downloaded when clicked. Once a hacker gains control of the app, they can continue to send whatever data they want until the app is updated to close the security gap, or removed completely. There is such a large number of affected apps that the security team couldn’t contact all of them directly. Instead, they opted to spread the word through the media. The vulnerability only affects apps using an HTTP connection. Most high quality apps use the more secure HTTPS connection. There’s code available to fix the problem, but it’s much easier to just remove the app. If it’s using an HTTP connection, you probably shouldn’t be using it anyway. This particular security flaw was specifically found for iOS and while it hasn’t been tested on Android, security experts note that it’s likely that would affect those users as well. If you believe you have malware infecting any of your devices, come by or contact Geek Rescue at 918-369-4335. We will fix your phone, tablet or computer and help make sure you’re prepared for the next malware attack.